The detail and complexity of the job (borders, multiple patterns, etc). Go from plain to pretty by enhancing concrete with one coloring method and one pattern. Get more elaborate with effects incorporating contrasts in color or a contrasting border. Design the ultimate with an artistic blend of hand-applied coloring, detailed patterns including monograms or a compass, or multiple pattern combinations. How to Get Stamped Concrete on a Budget? 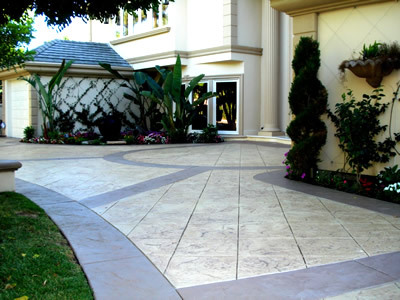 Try to use only one color and one pattern to keep stamped concrete at its most reasonable price. 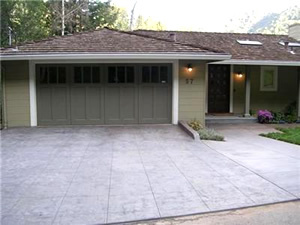 But you don't have to think of stamped concrete as boring to be budget-friendly. 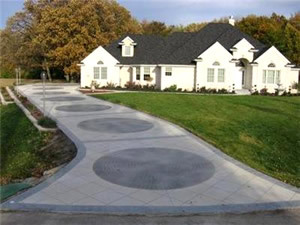 Consider changing the shape of your concrete to be curved, have control joints placed as curvilinear lines versus straight lines, or mix stamped concrete with fields of less-expensive plain concrete. Get more budget-friendly ideas for stamped concrete. What Makes Stamped Concrete Valuable? While the initial price of stamped concrete exceeds that for asphalt of plain concrete, it is much more competitive than installing natural stone, brick, or precast pavers. Stamped concrete is an aesthetic option for getting the look of real, more expensive materials for a fraction of the price. Learn about how stamped concrete adds value.